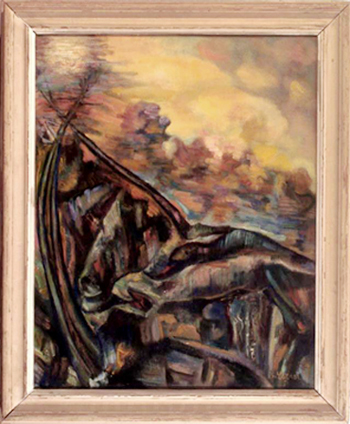 The Mechner Foundation seeks to bring the work of the painter Solomon Lerner (ca. 1890-1963) to the world’s attention. Considered by some to be one of the great post-impressionists, Lerner achieved only limited recognition, his career disrupted by World War II and his paintings scattered. The Foundation’s long-term goal has been to locate as many of his paintings as possible and display digital images of them on this website. It is estimated that Lerner produced between one and two thousand paintings, but the Foundation currently knows the location of less than one hundred of these. The rest are scattered throughout the world, mostly in Israel, the United States, Cuba, France, Germany, and Romania. When a painting is located, the Foundation arranges for it to be photographed so that it can make the world aware of Lerner’s work. The Foundation’s search for Solomon Lerner’s paintings has thus far involved the efforts of its staff and contacts from people who either own a painting or know about Lerner. It is likely that there are many individuals who have relevant information as a result of having known Lerner’s friends or family or owners of his paintings. These individuals can assist in the search by supplying leads and information that might be helpful, and we welcome their contributions. Prior to the digital age, the survival of great art–be it painting, music, or other art forms–may be the exception rather than the rule. Vincent Van Gogh’s work was recognized after his death through decades of promotional efforts by his brother Theo’s widow; Franz Schubert’s music survived because Robert Schumann happened upon a treasure trove of the recently deceased Schubert’s manuscripts in an old trunk at Schubert’s brother’s house; and Johann Sebastian Bach was gradually redisovered many decades after his death, due to the efforts of a few cognoscenti. The history of art and music is replete with examples of this nature. Given that the survival of great art so often depends on the efforts of individuals and fortuitous circumstances, it is likely that the works of many geniuses have been lost and forgotten. At this time, Lerner’s work is on the way to that fate. The Mechner Foundation recognizes Solomon Lerner’s genius as a painter and is dedicated to salvaging his work for posterity. Information about Solomon Lerner’s life and work can be found here. It was written by Dr. Francis Mechner, who had the good fortune of being Lerner’s student from the age of 10, when his family and Lerner both lived Cuba, from 1941 to 1943, as European refugees from the Nazis.